Slab Cottage "Cherry Tree Hill"
A visitor peers into the Slab Cottage, intrigued by the very basic living conditions of many years ago. Here is Jenny, our Duty Clerk, with some of the books we have for sale. You will meet her as you come in through the front door. 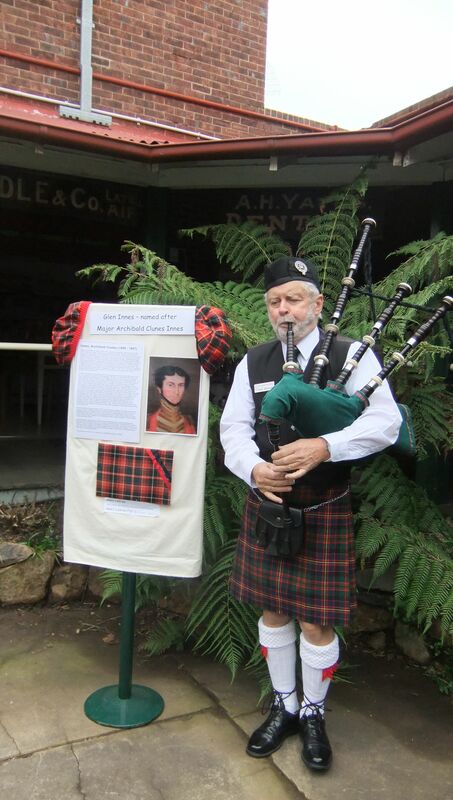 Pipe Major Paul Hanson wearing official Cameron of Erracht band tartan, in the courtyard beside the story board of Major Archibald Clunes Innes, after whom Glen Innes was named. 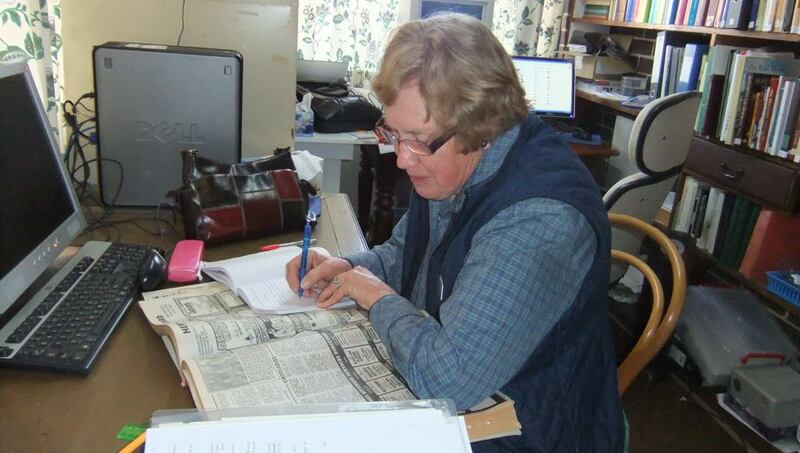 The Glen Innes Examiner newspaper has been indexed from 1874 and here Sandra works on the 1989 issue. We have almost the complete run in hard copy or microfilm. The cook has gathered her ingredients and her Scottish mother's well-worn used recipe book and one batch of shortbread has already come out of the oven. 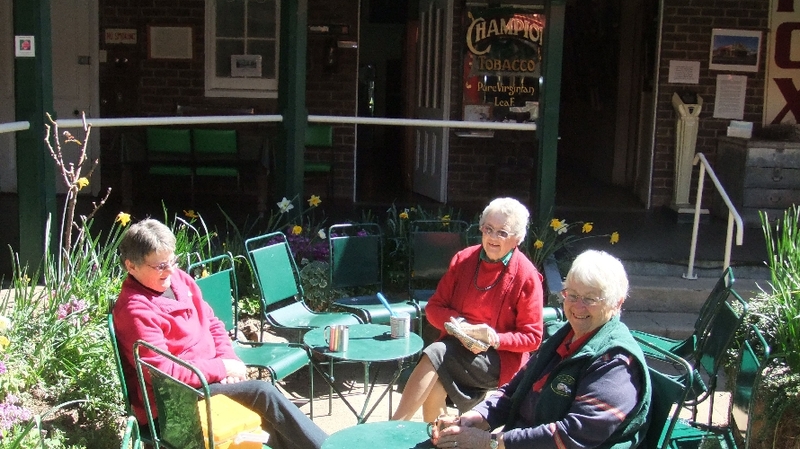 “So much to see… we didn’t realize it was so big… and we had a free cup of tea with staff in a lovely courtyard garden!’ are phrases often heard in our large Folk Museum & Research Centre housed in the former Glen Innes hospital complex. We have depictions of former times – an original slab hut, an Iron Lung, shop flying fox, sulkies, manual shearing machine, hand stitched clothes, grocer’s bicycle…in displays of scenes and themes eg Service Memorial Room…..all very evocative. 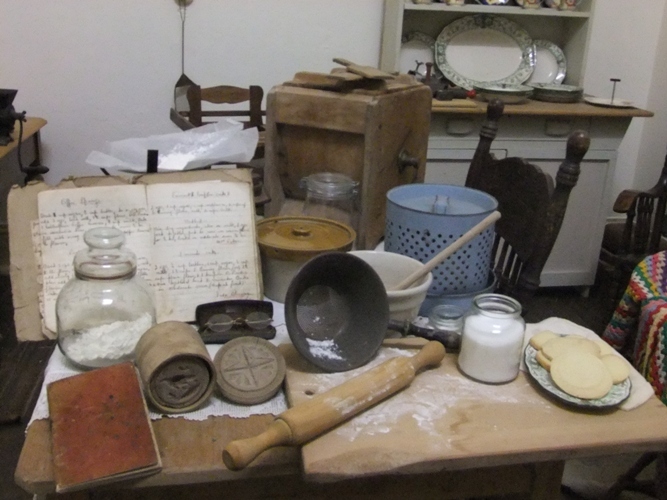 School groups can use quills, slate pencils or ink pens, or learn how to make butter. Not only the museum’s vast indoor collection but the historic buildings themselves, dating from 1877 and outdoor items including machinery, engines, tractors, boiling down vat etc., in the parklike grounds are all part of the tapestry of the history of Glen Innes & District. Special morning and afternoon teas and lunches can be provided for coaches & groups if booked ahead. The Research Centre’s huge resources include copies of the Glen Innes Examiner newspapers (indexed for 115 years from 1874), and handles constant requests for local & family histories. Please try to make an appointment and bring a USB and digital camera. Driver and host/hostess free with groups. 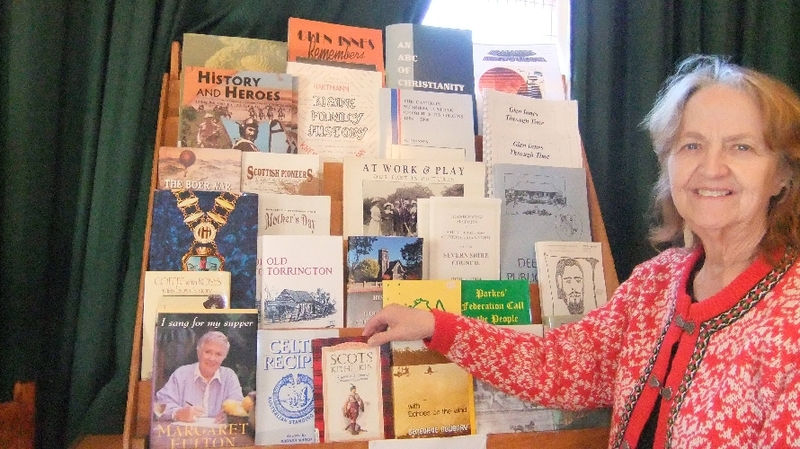 There is a range of Glen Innes and New England books available for purchase, as well as historic photographs and etchings of Glen Innes. The Research Centre within the complex has vast resources for both local and family historians including extensive card files, maps, photographs, Government Gazettes, the Glen Innes Examiner ( almost a full run in hard copy and microfilm) and this has been indexed from 1874 to 1989, NSW Government Gazettes from 1858 to 1898 likewise indexed. It is best of you can make an appointment, ring or email research@gleninneshistory.com.au as a member of staff needs to be here - please bring a USB, digital camera and copies of previous rsearch with you.